Keep up with the latest happenings in Myrtle Beach real estate and the Jerry Pinkas Real Estate Experts! 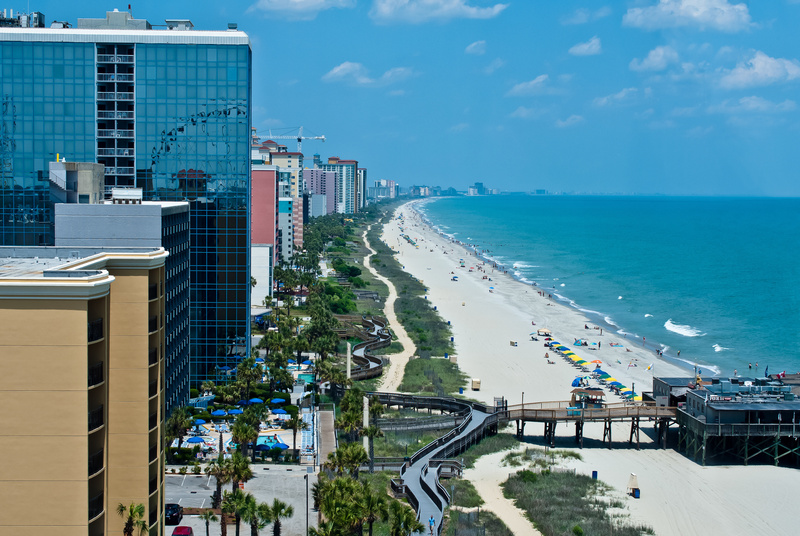 Every year, approximately 14 million people visit the beautiful city of Myrtle Beach, South Carolina. Are you interested in joining them? Not surprisingly, one of the greatest things about Myrtle Beach is the number of beaches you can visit. There are tons of great options to suit everyone's specific preferences, including many beaches that are 100 percent family-friendly. Don't know which beach to visit first? Keep reading. Listed below are eight of the best beaches near Myrtle Beach that you and your family ought to visit during your stay. Litchfield is home to a variety of scenic resorts and picturesque golf courses. While you're here, you'll also find gorgeous, white-sand beaches that are perfect for anyone who wants to kick back and relax while on vacation. There's plenty else to do besides relax on the sand while at Litchfield Beach, though. For those who like to get out and explore, there are tons of great shopping opportunities. You'll find plenty of adorable, unique boutiques that are perfect for picking up mementos to remember your trip by. There are lots of bike trails in the area, too. They're an excellent option for active individuals who want to take in the beauty of the beach in a new way. Garden City Beach features several stunning beachfront homes. It's a quiet, relaxing area that is ideal for anyone who wants to have a peaceful beach vacation. If you have older children who are content to kick back on the pristine white sand, Garden City Beach is a great location to visit. If you ever need a change of scenery, you can also check out the Intracoastal Waterway, which is located right across the street from the beach. When you're finished relaxing on the beach, you can grab a bite to eat at one of the many delicious restaurants to in the area. At the end of the day, you can also listen to great music at the pier, which features live bands and performers every night. The Cabana District is located at the northern end of Myrtle Beach, specifically between 79th and 82nd Avenues North. This area is known as the Cabana District because of all the brightly colored cabanas that are omnipresent on the shoreline. While you're here, you and your family can rent a cabana and relax with all the other families who are enjoying the beach. While your kids are occupied, you can even head over to Ocean Annie's Beach Bar at low tide and pick up a refreshing drink for yourself -- just make sure you get back before high tide! It costs $5 per person to get into Myrtle Beach State Park, but the price is well worth it. You and your family will love relaxing on the wide, sandy beaches and taking in the incredible views. In addition to the beaches, the park also features a pier that is the perfect spot for sightseeing and fishing. There's a nature center, too, and plenty of walking trails that will take you through the stunning oceanfront forest. You can even camp in the park, so you never have to say goodbye to the beach! For a classic beach vacation, you've got to pay a visit to Myrtle Beach Boardwalk. This is one of Myrtle Beach's top attractions, and it's no mystery as to why. The family-friendly area features a variety of restaurants and shops. 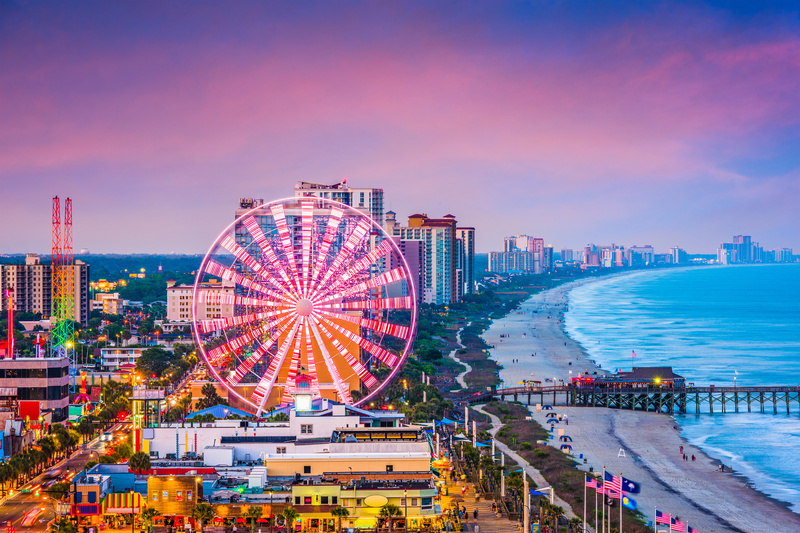 It's also home to lots of fun family favorites, from the Myrtle Beach SkyWheel to arcades and tons of exciting thrill rides. The beach is located just steps away from the boardwalk, too, so it's not hard to get there to relax when you've had enough amusement for the day. If you and your family love to take in local wildlife, Huntington Beach State Park ought to be at the top of your list of places to visit. Huntington Beach State Park is the perfect place to go for bird watching fanatics. You can also go for hikes and bike rides and can even visit the historic Atalaya Castle. Right across the street from Huntington Beach State Park is the Brookgreen Gardens. The Brookgreen Gardens are home to acres of gorgeous gardens and hundreds of unique sculptures. North Myrtle Beach has a quaint, nostalgic feel that is perfect for those looking for a quiet family getaway. This is considered one of the best family-friendly beaches in Myrtle Beach. It's the perfect place to go if you're an adventurous family that loves to kayak, parasail, jet ski, or go paddle boarding. North Myrtle Beach is also home to Tilghman Beach and Golf Resort, which is a great attraction for anyone who wants to get in a round of golf (or two) during their vacation. Hurl Rock Park, located on 21st Avenue South, was Myrtle Beach's first oceanfront park. The park was originally named after a collection of black rocks poking up from the sand. These rocks are now covered by sand, and they're difficult to see, even during low tide. There's still plenty to do at this great beach, though, including play mini golf at Pirate Watch Adventure Golf and take a helicopter tour. Because it's located between two large hotels, it's not a particularly secluded area, but it's a great place to visit if you want to socialize with other travelers during your stay in Myrtle Beach. As you can see, there are tons of great beaches near Myrtle Beach that you and your family can check out during your stay. Now that you know about all the options available to you, which one are you going to visit first? 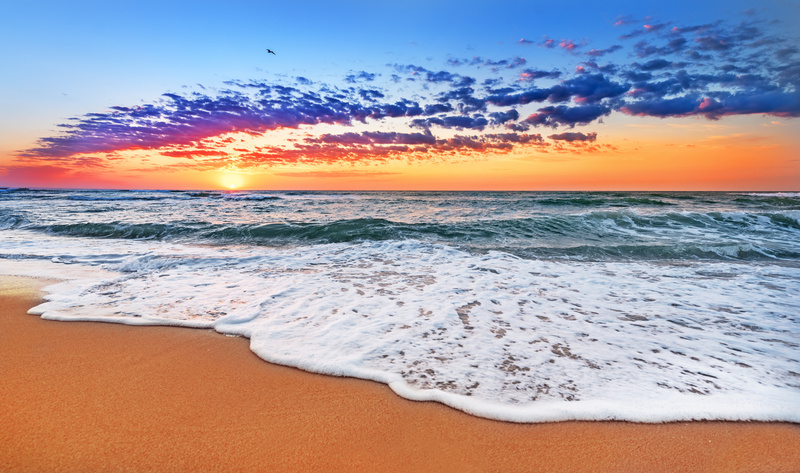 No matter which beaches you visit during your stay, one thing is for certain: after you check out the beaches near Myrtle Beach, you're never going to want to leave. If you want to learn more about buying some property here, we can help at JP Real Estate Experts. Contact us to learn more about our available listings or to take a tour today! A Pew Charitable Trust survey revealed that two-thirds of Americans believe they'll continue working past 65. 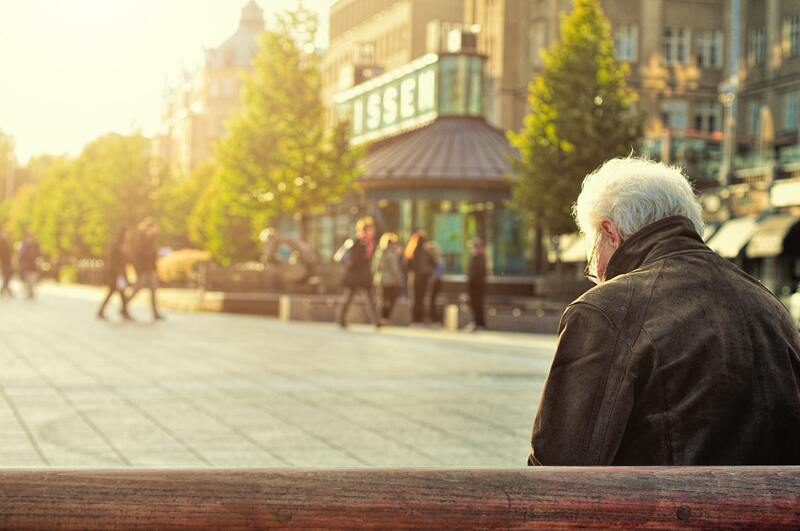 Knowing when you're ready to retire often depends on a variety of factors. And it's a highly personal decision. Some people love what they do so much they never retire. Others look for ways on how to retire early so they can do whatever they want. While for some people retirement may seem years away, it's important to learn about retirement as early as possible. Planning ahead can help you know exactly when it's time to retire. If you want to be in control of your own retirement, keep reading. We're sharing with everything you need to know about retiring on your own terms. Are you ready for retirement? If you don't know the signs, it's difficult to tell. Let's go through a few of them now. While Baby Boomers carry the least amount of debt, the average one still has around $36,000 worth of debt. Most of the debt is due to mortgages, credit card bills, and car loans. Carrying no debt allows greater flexibility in determining when to retire. It's a good idea to find ways to start paying down your debts as soon as possible. No matter what your age, it's a smart idea to work out a retirement budget now to help you determine when to retire. Start by figuring out what standard of living you want to maintain. Then factor in expenses such as housing, transportation, food, and health care. Calculate how much money you'll spend each year and how long you think you'll live for after you retire. Most people don't realize how important their health is until they get sick or injured. An unplanned illness or injury can easily financially ruin someone. While Medicare begins at age 65, it doesn't cover everything. If you require long-term care, Medicare doesn't cover that. If you plan to retire before age 65, make sure you can afford health insurance on your own. While you can go without insurance, it's incredibly risky, even if you're in good health. You may want to do research on other types of insurance such as disability, long-term care, and life insurance. Buying these types of insurance when you're young and healthy means cheaper premiums. Kids aren't cheap at any age. Even if your kids are adults, they may still require your financial assistance. And if you have children with special needs, their expenses may require you to work a few years longer. Always factor in any dependents you have when considering retirement. While relaxing at the beach may seem like a dream come true, it may get old for you quickly. And boredom isn't a good way to maintain your mental or physical health. It's important to stay active at any age, but especially after retirement. Factor in what types of physical activities you want to enjoy after retirement. If you feel that your job is beginning to cause physical problems, it may be a sign you're ready to retire. Since there's no age requirement for when you can retire, it's often a mental decision. Before you make the move to retire, take some time to consider how retiring will affect you and those you live with. If you don't enjoy having hobbies, the lack of mental stimulation can cause anxiety and depression. You may realize you enjoy your work too much right now to retire. There are a few extra things to consider before you retire. First, you need to have a discussion with the family members who live with you—especially your life partner. Retirement is a huge lifestyle change for everyone in your family. Make sure you and your partner are on the same page. Determine if one or both of you are retiring at the same time. If one chooses to retire first, you may want to consider rearranging common household responsibilities. Discuss how retiring affects your family finances. You may also want to look into other income streams after retirement. Check to see what age you can begin receiving Social Security benefits. The rules differ depending on when you were born. Most can begin receiving their benefits around ages 66-67. Also, just because you begin receiving those benefits doesn't mean you can't continue working. But you may want to wait a few years before you begin taking Social Security. If you wait until after you turn 70, you end up getting the largest possible monthly benefit. Especially compared to what you'd receive if you choose to begin benefits as soon as you're legally entitled to. Create a Social security strategy before you file. It's really difficult to change plans once benefits begin. If your employer offers a 401K, take advantage of it. Look into starting an IRA. If you're self-employed, open up a SEP account. Always invest as much as you can into the plan. The earlier you start, the more money you'll have upon retirement. When you turn 50, you're eligible to start making tax-advantaged contributions to your 401(k) and other employer-sponsored retirement plans. You can even contribute to your IRA. After age 59½, you're entitled to make withdrawals from your employer-sponsored retirement plans and IRAs. You can do this without getting hit with that 10% early withdrawal tax. However, you may still owe income tax on the distributions. At age 70½, you're required to take minimum distributions from IRAs, Roth's and 401(k) accounts. Make sure you understand the tax implications of these required minimum distributions (RMDs). Before you're ready to retire, it's a good idea to figure out if you want to stay where you are or move to a new location. Some states are better than others as far as living conditions, activities, weather, taxes. South Carolina is always listed as a great place to live after retirement. Myrtle Beach, in particular, is beautiful, sunny, and offers plenty of activities. Click here to find your new condo today. What's better than a Sunday morning cup o' joe and the paper? Better yet, what's more, scintillating than a major shopping spree bookmarked by some of the best coffee shops in Myrtle Beach? Not much! Whether you're here to vacation or start anew, you're going to love your time in Myrtle Beach. In fact, this little slice of heaven is still leading the East Coast's population boom. We saw a 3.9% population increase from 2015 to 2016. And there's a reason people are flocking to these shorelines. Here, there's something for everyone alongside the opportunity to rise with the sun each and every morning. Let's take a look at where to stop, refuel, and plan your life's greatest dreams. This coffee shop and tea house is located on Ocean Highway. This puts you right in the center of Pawleys Island. But, here's the best part. If you like to support local farmers and know you're enjoying a fully organic cup o' joe, Barefoot's the spot. These lovely baristas brew coffee that's been purchased directly from the farmers. No middle man required. If you're visiting with a tea lover, be prepared to wow them. All the teas here are organic and brewed right at your table. If you're in need of a snack, don't leave without sampling the delights of their crepes. And be sure to ask about the live entertainment. You're likely to catch a good spurt of live music if you time it just right. If you're visiting Barefoot Landing, this is your home away from home. These guys specialize in gourmet coffee, lattes, cappuccinos, and more. And, if you're "coffeed out," then dive into one of their fresh fruit smoothies. Even better, their renowned breakfast sandwiches are available all day. There's never a bad time for a sausage, egg, and cheese on a bagel. No matter your craving, this is the place to come with your appetite. Their sandwiches are piled high and their iced beverages are sumptuous. Caffe Diem always seems to have the right tunes pumping through their speakers at the right time. For a little ambiance and a lot of tastinesses, this is the spot. Their macchiatos are, particularly on point. Meanwhile, their menu is nothing to scoff at either. They offer not only gluten-free but also paleo selections. With a friendly staff, a bustling menu, and ambiance for days, you won't regret hitting the pause button here for a little while. The French Twist Tea Room sprinkles a little bit of Parisian Charm into these shorelines. Of course, you can enjoy a gourmet cup of joe when you're here, but you really want to take advantage of their wide range of loose teas. If it's a cool evening, pair that cup of tea with one of their delectable soups. If it's a true southern summer day, then you'll be excited to bite into one of their creative crepes. We're talking the likes of bacon, mushroom, spinach, and Gruyere cheese. Can't beat that! For a little charm, dashed with a bit of class, you'll be glad you and your loved ones dipped into this Parisian charmer. Located on Broadway Street, you're going to be in the heart of the action here. Better yet, these guys are the self-proclaimed "pulse of the artisan scene." You know what that means; you're going to have a finely brewed cup of coffee or a delectable cappuccino made by expert hands. Their "mission" is pretty cool, too. Right on their homepage, they attest to a desire to bring people together and establish connections to community resources and caring people. Sounds like a pretty nice place to stop and recharge. Do you have any friends on the bubble tea bandwagon? It's an Asian delight that you should definitely try. You'll discover sweet iced tea dotted with "bubbles", or pops of tapioca pudding. It's really a multi-sensory delight. Some might even find it more refreshing than iced coffee or tea. But, if you're stopping through, loaded with little ones, they're going to delight in the rolled ice cream. It's basically just a fancy way to give them the scoops of their dreams, but you're going to love every last bite. So, for something different, be sure to add this to the list. Who was ever sorry they took a break with bubble tea and ice cream? The Roasted Bean is situated on some prime real estate, right in The Market Common. This is where you go to savor sprays of lovely boutiques and family activities, including bowling and a theatre company. Given their location, you're likely to hear some live music pumping through their doors from the Common. So, while you're pondering their wide selection of drinks and savory snacks, you'll quickly realize you're glad you came. So, what do you say? After you fall in love with the sunny shorelines of Myrtle Beach, do you think you'll consider a move here? 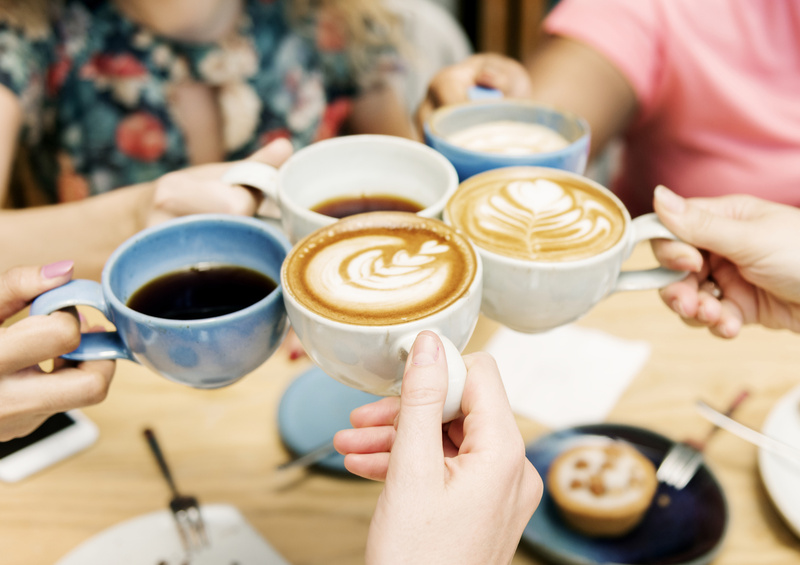 Not only will you find the best coffee shops in Myrtle Beach, but you'll also fall in love with the endless sunshine and tall, crashing waves. When it's time to make the move to paradise, we hope you'll give us a call here at JP Real Estate Experts. The beauty of this community is that, even though you'll be living right on the Atlantic, the housing market makes room for every budget. Houses here range from $180,000 to a couple million. You'll be able to make a home no matter how much you want to invest in that roof over your head. And, best of all, there are tons of shopping options at your fingertips, world-class restaurants, and coffee shops galore. There's a real community of people who love living here and we'll be glad to see you enter into this daily paradise, too. While you're enjoying life in the slow lane, here are seven ways to relax in beautiful Myrtle Beach. Myrtle Beach is a favorite spot, but there's much more to this region. Since the founding of the Carolinas in 1660, they've had a rich history that's left its mark on the towns, coast and in the cuisine. Are you looking to do a little exploring of the Carolinas, outside of Myrtle Beach? If so, read on to learn about the best day trips from Myrtle Beach. North of Myrtle Beach and over the state border into North Carolina is a beautiful coastal attraction. Calabash might only be a half hour drive from Myrtle Beach but you can spend the day there, and you have to include at least one meal. Calabash is famous for its seafood which is cooked distinctively. The unique cooking style is based on dipping the seafood in evaporated milk before drenching it in flour, cornmeal, and pepper. It's then deep fried until it is golden, crunchy, and delicious. Don't expect small portions. A Calabash style platter is generous which is what you would expect from southern hospitality. Expect to take home a doggy bag. After you've dined, find some time to explore the Sunset River Marketplace. The crafts on display include glass, pottery, and jewelry. You might buy and take home an example of local creativity. A little further away is historic Charleston. It's a 2.5-hour drive, but there's plenty to see and do for the whole day. If you are interested in history, the landmarks alone will fill your day. If you prefer retail therapy, there's plenty for you too. The history is of Charleston is best enjoyed by viewing the beautiful buildings. It was founded in 1670 and named after Charles II. Visit Fort Sumner, several museums housed in grand old houses, Fort Moultrie, and the Morris Island Lighthouse. It exudes the charm of a bygone age of southern manners and hospitality. The City Market offers shoppers many delights and is situated in the center of the city. Take a stroll through this welcoming city. Dining is a treat too with award-winning restaurants and a diverse range of cuisines. At the close of the day, make your way to the Charleston Waterfront Park or the Arthur Ravenel Jr. Bridge. These are the best places to take in the stunning sunset — a highlight to a fascinating and enjoyable day out from Myrtle Beach. If you're looking for somewhere to go the weekend after Mother's Day look no further than Little River. This is the venue for the annual Blue Crab Festival. It takes place on both Saturday and Sunday. Enjoy live music on the beach, cruise the specialty food stalls or shop for arts and crafts. It's family friendly too with a kid's zone with appropriate entertainment for the little ones. There's a comfortable going pace to Little River which makes a nice change from Myrtle Beach. The laid-back attitude extends to gambling too. Gambling boats set off for international waters twice a day to take high rollers and careful players alike out to chance their luck. If your taste is to take your chances with another type of boat, the fishing boats will take you for a spot of deep-sea fishing. Alternatively, a party boat might be more your style. Little River is 30 minutes north of Myrtle Beach up the Carolina Bays Parkway. A short drive but a great day out for the family or music-loving adults. Turn south from Myrtle Beach and the delights of Georgetown await you. It's a short ride down Highway 17. In less than an hour, you could be sitting in a harborside restaurant enjoying freshly caught fish. The harbor area is worth a walk to see the boats and when you've had your fill of them, visit the boat museum in downtown Georgetown. Lovers of history, boats and the sea will love it. To make more of a day of it, visit the historic plantation homes just outside Georgetown. Take a detour on your return to Myrtle Beach and stop by Pawleys Island to enjoy a cool breeze. This is where plantation owners took a rest from the heat of the intense Charleston summers. If the sculpture is your thing, drop in at Murrell's inlet area. Brookgreen Gardens have statues for all tastes in a beautiful garden setting. You'll find the natural beauty of Huntington Beach State Park is worth a visit too. Fancy a day's surfing? Never been to Folly Beach? It's time to sample the surf and other water sports at this popular location. Folly Beach is just over a 2-hour drive from Myrtle Beach. There are several surf spots, and the public beach is a busy, fun place to hang out. Try your luck on Folly Beach Fishing Pier. If you don't have your fishing equipment, you can hire a rod and bait at the pier. It's fun to fish even if you don't catch anything worth keeping. You've hardly left Myrtle Beach, and you're already in Conway. It's a river town with a pretty downtown area and a riverside just perfect for a stroll. The Waccamaw River Memorial Bridge passes over the head. A riverboat cruise or a paddleboard are both great ways of exploring the river depending on your preference. The Conway Marina is a great place to watch the coming and going of the boats. Save some time to visit the Ocean Fish Market. You can buy fresh seafood to take home to Myrtle Beach. A top local restaurant is the Rivertown Bistro. Its reputation reaches right across South Carolina. It's elegant, fashionable, and you are advised to book a table ahead of time. Day trips from Myrtle Beach give you the opportunity to explore the rich culture of the Carolinas. The beautiful coast, historic towns, and welcoming hospitality make every day a pleasure. Explore it and enjoy it. Here are some more family activities in and around Myrtle Beach. Almost 20 million people chose to visit Myrtle Beach in South Carolina each year. The main reason people visit this area? The beaches. But with that many people visiting, you may think it'll be hard to relax on the beach. But you're wrong. There are plenty of relaxing ways to unwind in Myrtle Beach. There are plenty of things to do in Myrtle Beach, so you won't be bored. Keep reading to find the best ways to relax on the beach in this South Carolina destination. Broadway at the Beach offers a non-traditional approach to unwind and relax at the beach. There are activities here for people of all ages and interests. Take some time to yourself to explore all the shops and restaurants. You can find everything from souvenir shops and boutiques to ice cream parlors and pizzerias. If you're up for a little excitement, try a ride on the 118-foot Ferris wheel. If you have children, make sure to check out the dinosaur exhibit, complete with a digging station for dinosaur bones and life-size replicas. If you're a music lover, stop by Legends in Concert. Each show features five acts of tribute performances. The actors sing live and dress exactly like their original legends. You'll never know the difference. Looking for other ways to unwind at the beach? Check out Barefoot Landing. This popular destination is set along the Intracoastal Waterway. Its location offers breathtaking scenery, perfect for any relaxing stroll. But, if your idea of relaxation is having fun, you're also in luck. Besides the many restaurants and stores, you can also enjoy live entertainment at the Alabama Theatre or the House of Blues. And, every Monday night during the summer, you can watch a fantastic fireworks show! There's also a carousel, boat tours, and an amusement park. A little fun and relaxation for everyone in your family. Myrtle Beach State Park is an excellent location for any nature-lover to relax and enjoy the outdoors. The park is home to a mile of Grand Strand beach. So whether you enjoy sunbathing, seashell searching, or fishing, there's a spot for you and your family. You can also choose to disconnect from the world and camp at the park. There are over 350 campsite options that include cabins, tent space, and locations to park your RV. When you're not at the beach or your campsite, take a relaxing hike around the park. The walks take you along the beach, into forested areas, and along freshwater ponds. 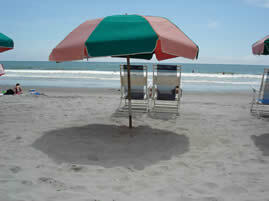 While not technically in Myrtle Beach, Surfside Beach is a short drive away and a great place to relax on the beach. It's often called Family Beach due to its family-friendly atmosphere. If you enjoy shopping, stop by Old Time Pottery and Hudson's Surfside Flea Market for some unique treasures. If you're looking for a family activity, check out Wild Water and Wheels. They have over 30 water slides, a lazy river, and separate pools for families and adults. 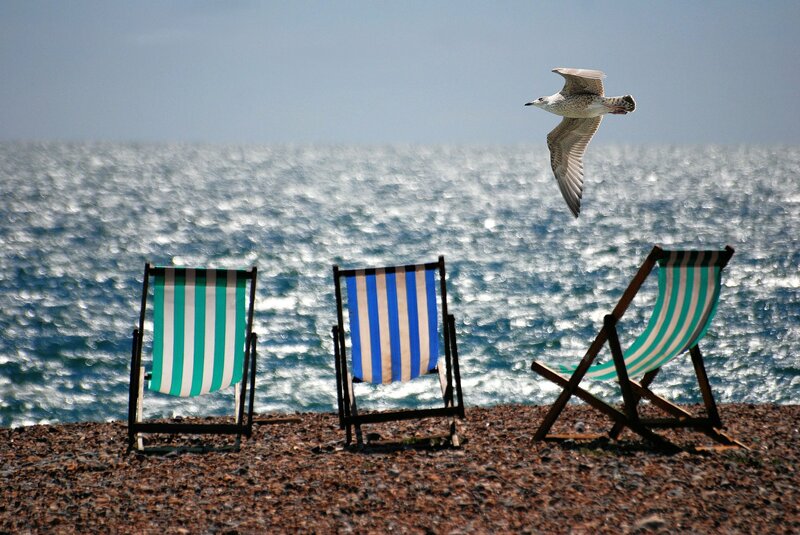 If you're there for the beach, rent a deck chair and hang out for the day. 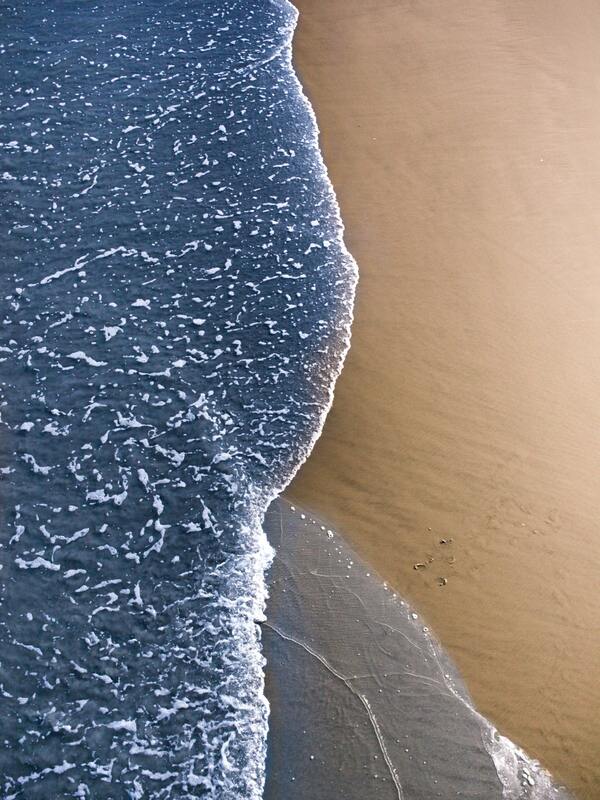 Listen to the sound of the waves and feel the sand in your toes as you let your worries wash away. Kokopelli Surf Camp is the perfect place to visit if you wish to unwind and relax on the water. This locally owned and operated business offers surf lessons, paddleboard and kayak tours, and rentals. During surf lessons, you'll learn from pro surfers. They accept all skill levels and guarantee that you'll be surfing during your very first lesson. You can experience private or group lessons, surf camps, and even surf parties. If you're looking for paddleboard or kayak tours, this is the place to go. You can enjoy island, salt marsh, and sunset or sunrise tours depending on what you wish to explore. If you'd instead explore solo, rent a kayak, surfboard or paddleboard and receive free delivery. Looking to tour the local scenery but in a more relaxing way. Take a Waccamaw river tour. You'll explore the amazing wildlife that calls the Waccamaw River and the Intracoastal Waterway home. There are three different tour options to choose from depending on what you want to experience. If your idea of relaxation is getting to know the local wildlife, try the nature and wildlife riverboat cruise. This narrated tour is frequented by birds of all species, turtles, and alligators. If you enjoy photography, try the Osprey photography tour to get that once-in-a-lifetime photographs. And there are private tours available if you wish to tour the waters in peace without distractions from other guests. While not exactly on the beach, Brookgreen Gardens is one of the most relaxing places in Myrtle Beach. Brookgreen Gardens combines art, history, and nature all into one fantastic location. Take a guided tour of the area to ensure you see the high spots or choose to explore the grounds on your own casually. Either way, you're in for a delightful day. The garden is home to four main attractions: American sculpture, Lowcountry history, botanical gardens, and Lowcountry Zoo. They also have special events throughout the year so make sure to check out their calendar if you're planning a visit. Now you know all about the seven best ways to relax on the beach in Myrtle Beach, South Carolina. If you want to take your relaxation to the next level, consider your own Myrtle Beach condo. Having your condo eliminates the hassle of renting your vacation home each year and provides peace of mind. You might find yourself so relaxed that you consider moving to the area permanently. 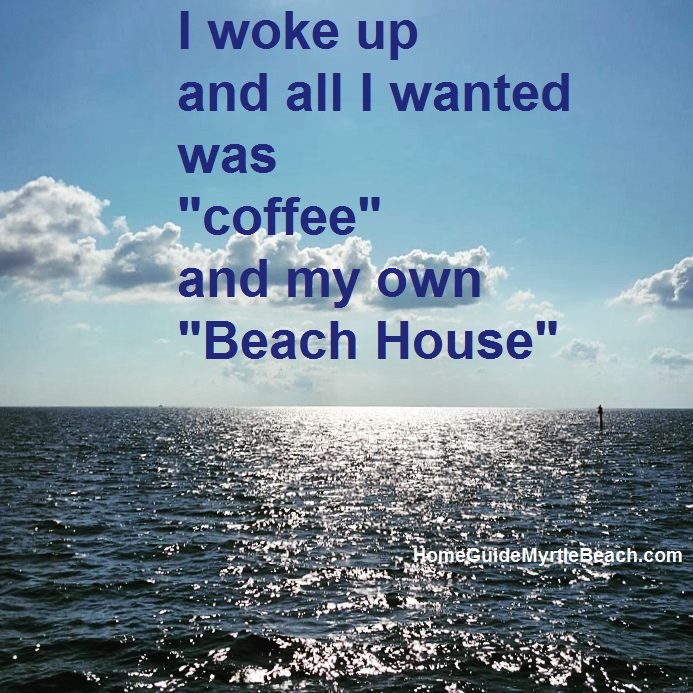 If so, JP Real Estate Experts has the best local listings to find your Myrtle Beach dream home. Visit our blog to discover all the great attractions in and around Myrtle Beach! Life doesn't get much better than living in an oceanfront condo in Myrtle Beach, aka, the best beach in South Carolina. As if that wasn't enough, Myrtle Beach also made a list for one of the best places to live in America. And it's no wonder. Myrtle Beach has a thriving job market, is full of family-friendly activities and boasts miles of stunning sandy beaches and a mild climate. All that sounds like the perfect recipe for a great life by the coast. 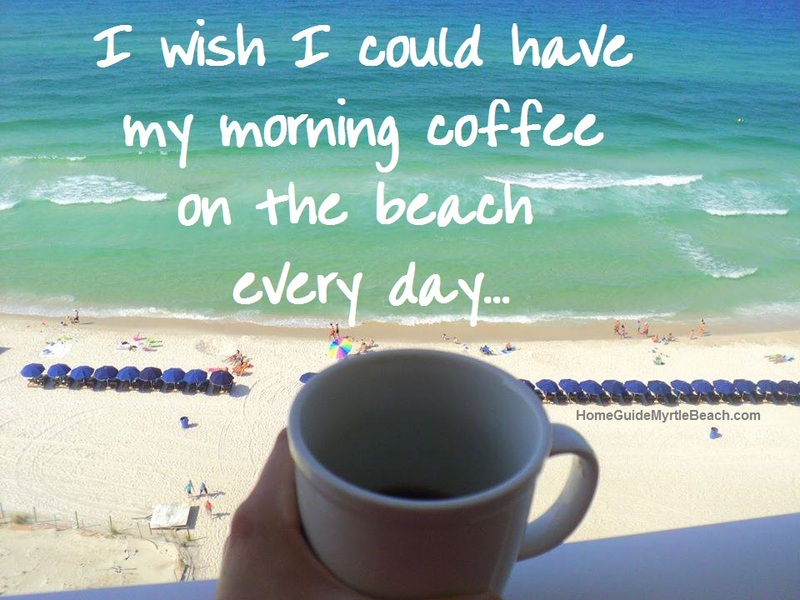 And with an oceanfront condo, you can make the most of having the beach on your doorstep. But there's just one dilemma. How do you make your Myrtle Beach condo your own? You want your decor to complement your coastal location. But you also want your home to represent your style and preferences. Check out these coastal decor ideas for new and original ways to bring the outdoors in. One of the main advantages of an oceanfront condo is the natural light that comes streaming in from the coast. Take advantage of this by keeping your windows bare for an uninterrupted view of the ocean all day long. Or, at the very least, keep your drapes light and airy to complement your beach house decor. Another way to create a light and airy atmosphere is to center your color palette around a white base. This makes rooms appear bigger and brighter and brings the wide-open feel of the coast into your home. But, so as not to overdo the white, add color and texture throughout. Ways to do this include wooden flooring, rugs, house plants, patterned tiles, and colorful soft furnishings. Blue is often a favorite color for home decor, but it's almost a given when it comes to coastal decorating ideas. Of course, it's not hard to see why, with the blue waves out there inspiring you, it's only natural to want to bring the ocean inside. But, the beauty of the ocean is the many shades of blue it encompasses, from deep navy to warm turquoise. If you're going for blue as part of your beach house decor, consider ways to incorporate this range of shades through different patterns and textures. Adorn wooden tables with blue glass vases, or add a pop of color to your seating area with a plush powder blue armchair. Make a feature of turquoise and white geometric wallpaper, or add a blue patterned rug to your living room. And, in the kitchen, a delicate navy and white tiled backsplash can add interest. If you're lucky enough to live in an oceanfront condo with a balcony or terrace, then this outdoor space deserves your attention too. After all, as much as you try to bring the beach into your home, warm sea breezes and the sound of crashing waves are just two of the many benefits of coastal living. As such, you'll want to spend as much time outside as possible when the warm weather comes. Even if space is limited, deep-seated chairs or comfortable sun loungers are a must for an inviting outdoor space. These are perfect for reading and relaxing. And, if there's room, a small table adds extra convenience and creates more of an entertaining outdoor area. While a blue and white palette evokes a coastal feel and makes the most of the natural light, these colors can sometimes feel cold. Which is why you need to take inspiration from the sand as well as the sea. Sand-colored accents add warmth and help to break up the coolness of a blue and white combination. Consider items such as jute rugs, wicker chairs, a sand-colored candlewick bedspread, or a wicker ottoman center table. A bonus of natural-tone accessories like these is that they also add texture to your home, which helps bring a minimal color palette alive. When decorating an oceanfront condo, it's all too easy to go overboard (pun intended) with beach-themed home decor. You might start with a couple of nautical knick-knacks. 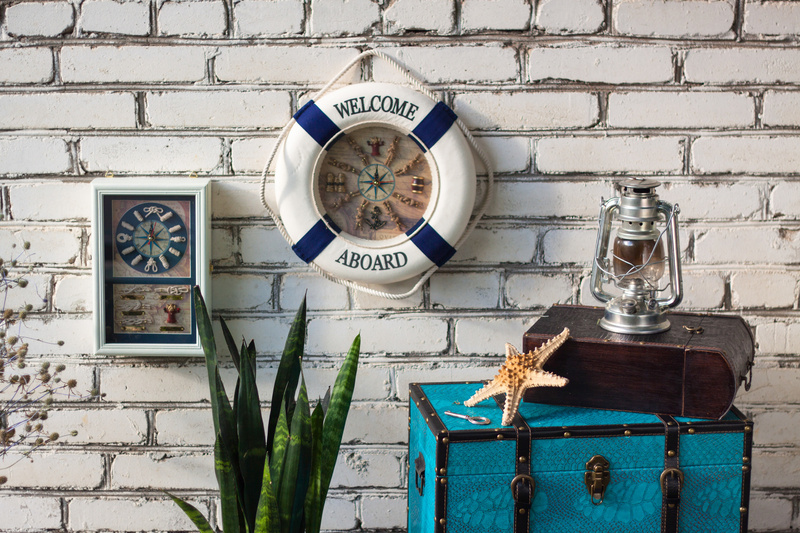 But, before you know it, your home is so full of anchors, starfish and deckchair prints that you feel like you're living in a seaside souvenir shop. There's nothing wrong with taking inspiration from the natural beauty offered by the coast. But subtlety is key. A coral pattern is an unexpected way to evoke an ocean theme. Plus, 'Living Coral' is tipped as the color of 2019. Shell coasters are another subtle option. 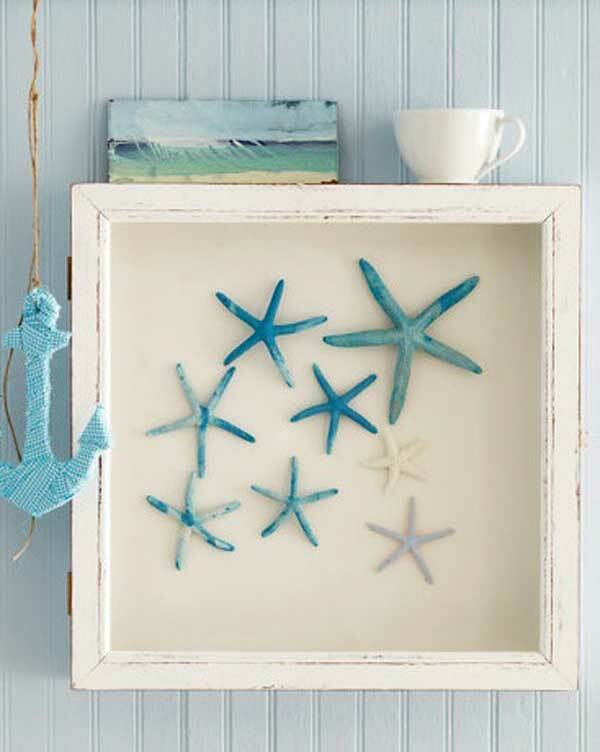 Although shells are a classic coastal decor item, keeping the touches small and practical works. And, you could try an abstract shore-inspired print for a sophisticated way to adorn the walls. The result will be a home that references rather than exploits the relationship to the nearby ocean. For many people, there's no better time of day at the beach than sunset, when the open sky is lit up with shades of orange, purple and pink. These sunset colors add warmth to the blue sky and contrast beautifully with the ocean. And, these colors can bring this same warmth and contrast into your beach-themed home decor. Consider occasional pops of color inspired by the sunset sky. This could include throw cushions in shades of burnt orange and peach, or matching dark pink lampshades at either end of the sofa. There's no reason you have to limit yourself to American-style beach house decor. After all, with the ocean on your doorstep, why not take inspiration from coastal homes across the waters? For a laid-back communal area, opt for low tables, cotton rugs and sumptuous floor cushions propped against decorative arches for a Greek island feel. Or, you might prefer a Moroccan-inspired coastal riad vibe. Mix delicately patterned wallpaper punctuated with antique metal scones, and bright white sofas loaded with cushions. When it comes to coastal decorating ideas, think about the places you've visited or would love to visit. Because, even if you can't make it to that villa in Capri or that Ibiza hideaway, you can reflect what you like about these beach locations in your own home. As these coastal decor ideas, there's plenty of scope for original ways to make your Myrtle Beach condo your own. By considering the colors and styles you love, as well as how you plan to use your space, you're sure to enjoy every aspect of your home as much as you like its location. And, if deciding how to decorate a beachfront condo in Myrtle Beach sounds like a problem you'd like to have, check out these condos for sale. Or, for more information, get in touch with us today! South Carolina didn't make Forbes' list of best places to retire in 2018 for no good reason. The Palmetto state is perfect for seniors. It's got gorgeous beaches, tons to do, and the perfect climate-not to mention, the cost of living in South Carolina is lower than the national average. 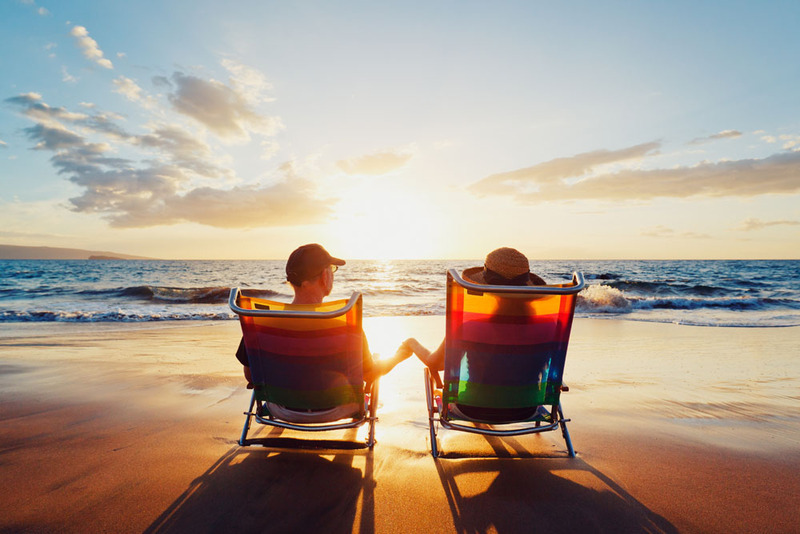 When it comes to nailing down the exact locale for your retirement, though, where do you start? What are the best places to retire in South Carolina? Read on to learn everything you need to know so you can start planning your dream retirement in the most charming state in the U.S. today! If the idea of sipping a mint julep on a rocking chair on a wraparound front porch underneath some Spanish moss has you charmed, you're in the right place. A retirement in South Carolina seems like it's in your future. Different locales offer different things, though. Myrtle Beach is easily one of the most popular locations for retirement-it's one of the most beautiful beaches in South Carolina. There's top-notch dining, like the fresh Gulf Stream Cafe and inventive Fire and Smoke. There's also tons to do when the family comes to visit for the holidays, including a Christmas regatta. Myrtle Beach hosts more than your typical boardwalk, too. The Myrtle Beach boardwalk features a Ripley's Believe It or Not Museum, a movie theater, an aquarium, and tons of restaurants. Don't forget the Ferris wheel! Myrtle Beach has something to offer retirees of every style-and of every budget. There are usually retirement condos for sale in almost every price range, so it's the perfect place to start looking for your future home. For those who like a slower pace with access to the amenities of a bigger city, Conway is perfect. It's just a stone's throw to Myrtle Beach, so you'll still be able to head over there to use the golf courses, big beaches, and go shopping. You'll enjoy a lower cost of living in Conway than Myrtle Beach, too. Conway itself is cute and quaint. The downtown area features bistros and guest shops, thanks in part to the city's Main Street revitalization project. The city also has a great RiverWalk, along which resides a few great restaurants you can check out on the weekend. If you want a quiet retirement full of tons of days on the green and weekends out at your favorite local haunt, Conway just might be for you! Pawleys Island, an island just off the coast of South Carolina near Charleston, is steeped in history. In the 1700s, the first European settlers first arrived there seeking refuge from mosquitos on the mainland. They worked the rice plantations there, and the mosquitos carried a terrible disease: malaria. Today, Pawleys Island reflects its history as a getaway. Houses look like retreats more than anything. Most are on stilts, and they're covered in windows, allowing light to completely drench the inside. That morning light streaming in through your windows, with nothing obstructing it, will embody serenity as you relax over a bowl of oats! When it comes to the logistics, Pawleys Island has multiple neighborhoods to choose from. It also has low property taxes, like the rest of South Carolina, and provides a large retirement income tax deduction. 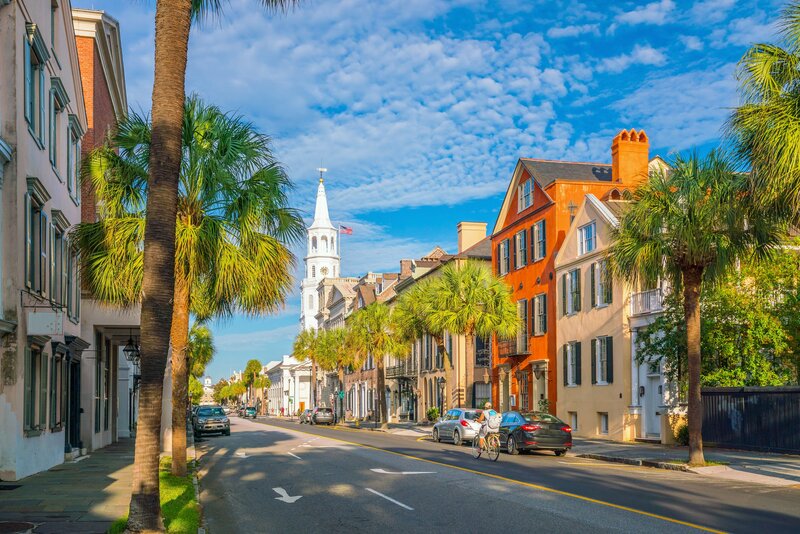 Charleston is not only one of the best places to retire in South Carolina, but it's one of the best places to live in the south! If you're retiring early and looking for a city with more to do than playing golf and eating out on the weekends, Charleston's your city. Its economy is thriving, which makes it a great space for young entrepreneurs to take risks on new businesses. As a consumer, that means more fun for you. Think about innovative new restaurants and fun new tech startups. Tourism is also huge in Charleston, so it's incredibly clean all the time. There are lots of city-sponsored events all the time, including tons of things around the holidays! If you're looking for a happy medium between Charleston and something more low-key, Greenville might be for you. It has tons of historical sites, lots of which have been turned into wineries and breweries for casual outings. Since Greenville has such a wealth of historical buildings, you won't have a hard time finding an old Victorian if you're looking to retire in a cool old home! Greenville has an up and coming culinary scene, too, which is great for retirees interested in gastronomy. It also offers a more rugged terrain than Charleston for those who like to get into nature for some light hiking every now and then. Like Pawleys Island, Hilton Head has a rich history: it's actually South Carolina's namesake. When the English first arrived here in the 17th century, they named Hilton Head "Carolina." It wasn't until Captain William Hilton's exploration of the island a few years later that the island was renamed after him, and the name Carolina moved to the mainland. Today, Hilton Head is home to some of the most luxurious retirement communities in South Carolina. It's one of the best places to live in South Carolina for retirement and otherwise. Think beautiful kitchens, luxe bathrooms, pristine golf courses, and private beaches. The island is home to a whopping 22 golf courses, with almost 30 more just a stone's throw away. The weather is perfect, and it's only 20 minutes from the airport when the family comes to visit! There's a lot to love about South Carolina, not the least of which is the temperate climate, the gorgeous beaches, and the great dining. These are just a few of the things that make living in South Carolina so great. And know that you know a few of the best places to retire in South Carolina, you're ready to start your condo search! Need help? We've got you. Get in touch to talk about your South Carolina retirement today! Tourism is a $20.2 billion industry in South Carolina for many reasons: the culture, historical landmarks, food, and, of course, the fantastic beaches. With 187 miles of coastline, you have hundreds of beaches to choose from for a beautiful sunny day in the sand. But we all know the disappointment of arriving at a beach that's subpar: rocky, shady, not enough activity, and so on. We're going to go over the top seven beaches in South Carolina so you won't be disappointed when you arrive at the destination. Whether you like pure sunbathing relaxation, a day with the family, or surfing the waves, there's a beach on this list for you. 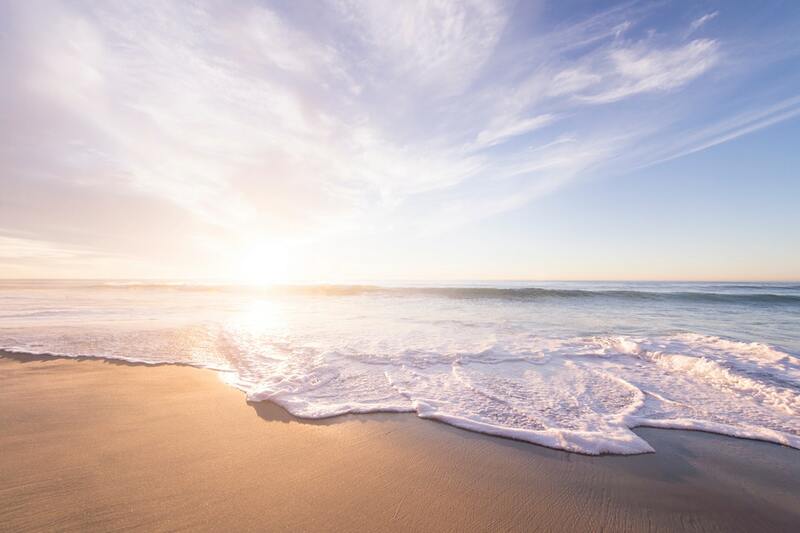 You probably could have guessed that we would put Myrtle Beach first, but that isn't just because of who we are: it indeed is one of the most popular beaches in South Carolina. Not only is the beach itself an excellent spot for families and sunbathers, but it's also perfect for water sports, scuba diving, swimming, and more! That being said, it's a popular tourist destination, which means you're likely going to be surrounded by many other people. If you don't mind sharing the waves, then Myrtle Beach is a top-notch option for a sunny day. A trip to Myrtle Beach will give you a full day of summer fun beyond the sea and sand. If water sports are your thing, then Folly Beach is for you. Boating, kayaking, swimming, surfing, and kayaking are all super popular at this South Carolina beach. Surfing schools often come to Folly for the natural beginner waves (except when there's been a recent storm!). You can even sign up for boating and kayaking tours where you can go fishing, scuba diving, dolphin watching, or enjoy a day on the water. Fishing is another activity that Folly Beach is known for. If you're looking to reel in an impressive catch, try deep-sea fishing. You can also fish off the famous fishing pier in the nearby rivers. The mix of locals and tourists here will give you an authentic South Carolina experience. The action of Myrtle and Folly are too much for some people. 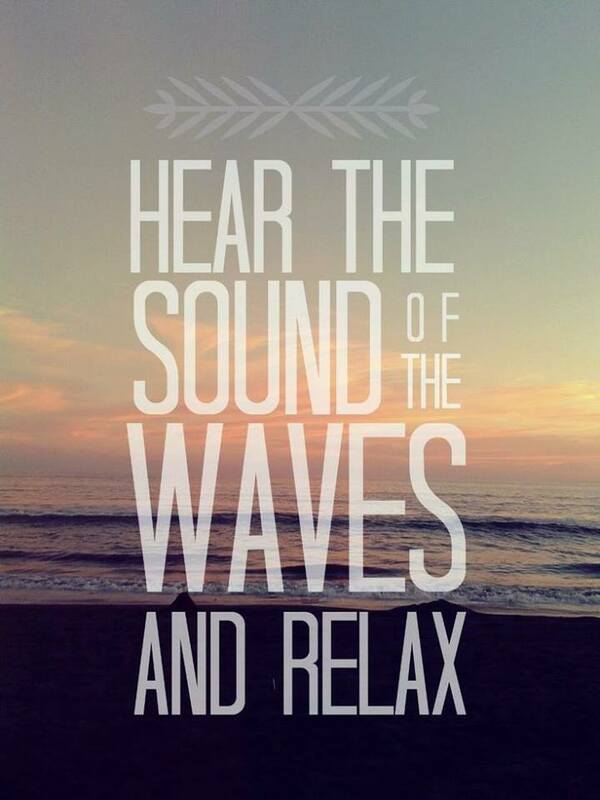 If that sounds like you, try out the relaxing and lowkey Isle of Palms beaches. Known for the luxurious homes and resorts, this location is a short way from Charleston. The quick trip there will be worth it for the relaxing peace you'll get. This place is perfect for those looking to unwind by the water with a romance novel and a vat of sunscreen. You can also easily explore the island via bike or golf cart (the preferred mode of transportation) for a fun family adventure. If relaxation and sunbathing sounds a bit too dull for you, try out a beach that's chock full of activities and adventures. We recommend the Huntington Beach, State Park. As the name suggests, this beach is also a state park, so you'll need to pay an admission fee. It's only $5, though, and you'll get access to swimming, fishing, hiking, boating, wildlife tours, and more. Kids under five get in free! You'll also have access to picnic areas, bathrooms, WiFi, and gift shops, making this spot perfect for families and tourists. Many destinations we've gone over so far are going to be teeming with tourists, families, young children, and generally crowded areas. 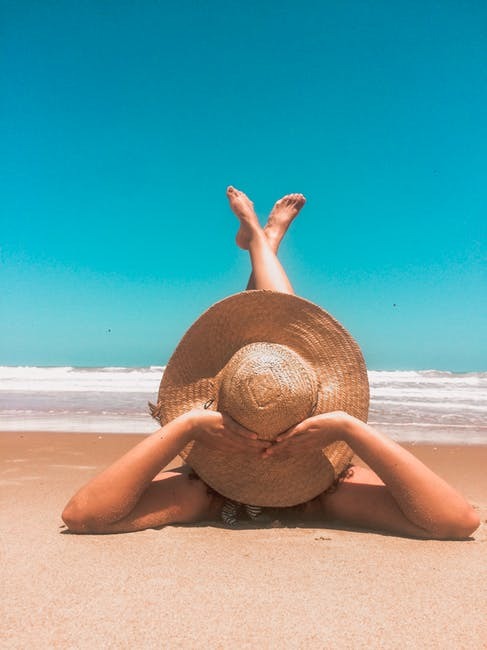 Edisto Beach is the opposite of that: it's known for being tranquil, peaceful, and one of the least commercialized beaches in all of South Carolina. This spot is perfect for couples on romantic getaways, small families, or those looking for some quiet solitude. You can go for one of the picturesque beachside vacation homes in the area or take a day trip to more popular beaches. It's also known for being upscale, so you can leave the beach for a five-star romantic dinner, sunset boat tours, and peaceful spots for camping under the stars. Speaking of upscale, Hilton Head is a well-known luxurious vacation spot and a top destination on the entire East coast. It's both commercial and Myrtle-Beach-like while also being tranquil and Edisto-Beach-like. Hilton Head is an excellent combination of calm and exciting with something for everyone. Water sports like paddleboarding, kayaking, swimming, boating, and surfing will keep the adventurous ones busy, while the rolling dunes, miles of calm beaches, and gorgeous oceans views will keep everyone happy and relaxed. You're also close to great nightlife, restaurants, and activities right off the beach as well. And lastly, we have the gorgeous Kiawah Island. Along with the excellent access to water sports/activities and miles of beach to kick back in a chair and relax, Kiawah Island is known for its wildlife and natural beauty. Dunes, maritime forests, marshes, and (of course) the sea are all accessible for touring. You can spot wildlife in their habitat, take gorgeous snapshots of the natural beauty, and take long walks on the beach. Kiawah is also known for four spectacular golf courses if you need to shield yourself from another sunburn. 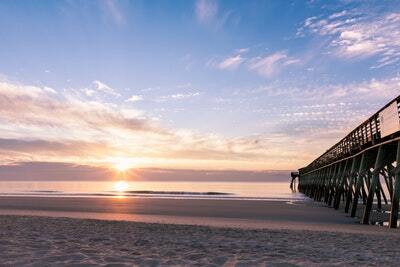 Best Beaches in South Carolina: Which Will You Visit First? While this list of beaches in South Carolina is far from a comprehensive one, these are the top ones you want to check out. Each of them is known for different things, so try them all out for a different adventure each time. Have you decided which you want to visit? Too impatient to wait for summer to roll around? There are still plenty of activities to do in the winter. Check out this article for a list of winter activities in Myrtle Beach to get you started on your winter vacation itinerary! Is Living in a Condo Right for You? Living in a condo can seem like a good idea. Maybe you'd like to downsize, or not have to worry about all the maintenance associated with a house. Renting an apartment just isn't your thing so you're looking at buying a condo. But is it really a good idea for you? 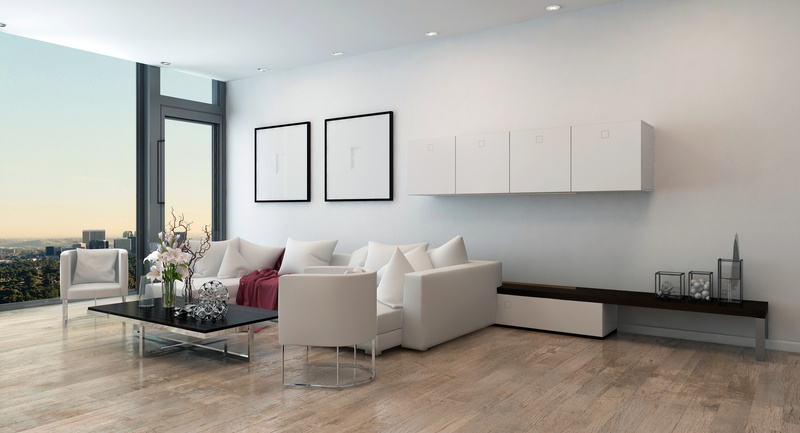 Read on as we weigh the pros and cons of condo living to help you decide. Whether or not living in a condo is right for you is a very individual decision. Let's look at the advantages and disadvantages to help you determine where you fall. We're positive people, so let's look at the advantages first. Do you hate yard work? Then you'll love the fact that someone else handles the outside maintenance in a condo. Part of the fees that you pay to the homeowner's association (HOA) covers the cost to have this taken care of. The HOA also covers big expenses like having the windows replaced or making repairs to the building after a storm. If the reserves don't cover the cost, they may ask for a special assessment. But the bottom line is that you don't have to pay for everything yourself. Beware though, just because this is the HOA's responsibility doesn't mean they do their job well. Do your research beforehand to ensure that it's a well-run HOA. Would it be nice to have a pool you don't have to maintain? How about a gym on-site? How about a party room or barbecue spot by the pool? Some condos even have a community theater! Many condos have a nice range of amenities that would be expensive to have and maintain at a single-family residence. This cost is included as part of your HOA dues and shared among the owners. Of course, you'll have to share them with your neighbors but the more the merrier, right? Do you want to live in the heart of a bustling city? In that case, a condo may be your best bet. Not only are single-family homes nearly impossible to find in the city they're also prohibitively expensive. Condo fees in a prime location will be higher as well, but still much more affordable than your own piece of land. It's a great way to be near your work and all your favorites hotspots. You may not even need a car since everything is nearby so you can save on gas and car insurance! Condos provide an added sense of security. Many have a coded entrance visitors must go through before having access to your front door. Fancier condos may even have a security guard at the front. If you plan to travel a lot, it's also nice to have your home enclosed and your neighbors close. In this type of space, it's far less likely that your home will be vandalized while you're gone. However, living in a condo is not for everyone. Let's look at some disadvantages so you can decide if any of them are a deal breaker. Depending on where your condo is, the cost can be an advantage. For example, in the heart of the city as we discussed earlier or when living by the ocean. However, in many cases, owning a condo is more expensive than a freestanding house. Someone has to pay for the landscaper and maintenance man. Plus, those nice amenities don't come for free. All of those things are paid for out of your HOA dues. When special damages happen, like a storm or vandalism you may be required to pay special assessments to cover the cost. Furthermore, you don't get any say in hiring the company to repair the damages. As a homeowner, you'd shop around for the best deal. The HOA may not be quite so diligent. You also don't get any say in when repairs happen. Your condo may need new windows, but if the HOA decides it's not a priority it'll be a while before you get them. An extension of the cost is cost sharing. At first glance, this might seem like a good thing. You're not wholly responsible for storm damages etc. But what happens when someone damages the common room or breaks the barbecue? It was probably one of your neighbors, but unless they fess up everyone gets to pay for the repair. In an ideal community, this wouldn't be a problem. But most communities are far from ideal. There will be at least one neighbor that loves to throw drunken bashes and constantly damages community property. If your home also doubles as a real estate investment for you, condos are usually not as valuable as a freestanding home. HOA fee increases may outpace the appreciation of your property. You may be forced to sell your condo for much less than you wanted to entice a buyer to accept the burden of those fees. There are usually rules and regulations that you have to follow in a condo. Quiet hours, pet policies, and parking rules are just a few things that may be in place. Depending on what they are, the rules may not be an issue for you. Just be sure you know what you're signing up for. It's true that you can't pick your neighbors regardless of where you live. But in a condo, you are more closely tied to them. Not only are they (usually) in closer proximity, but also there are the cost-sharing issues we touched on earlier. In a great community, the neighbors will never get to be a problem. But, to be honest, you'd have to be extremely lucky to find a community like that-- and there's no guarantee it would stay that way. What do you think? Is living in a condo right for you? If you want to get started browsing beach condos in Myrtle Beach, feel free to check out our listings! 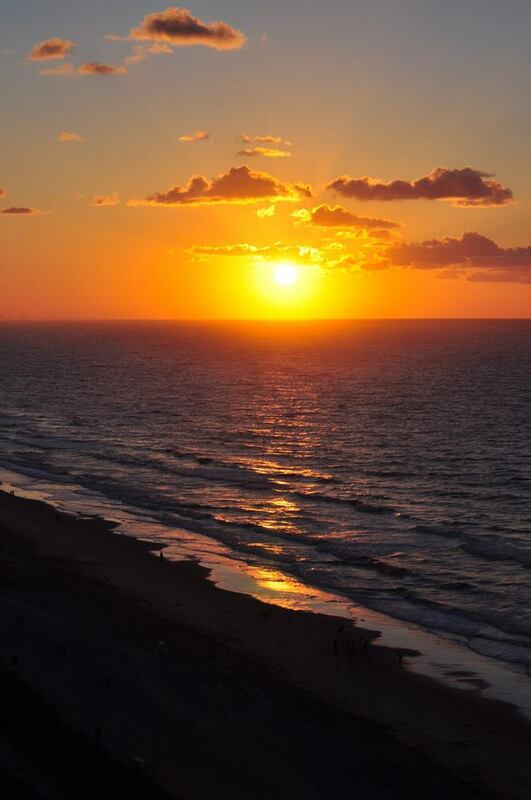 There's a reason over 14 million people visit Myrtle Beach each year. It's stunning. Myrtle Beach's Grand Strand has miles and miles of white sandy beaches and rolling waves. Myrtle Beach also offers some great attractions. Take the Myrtle Beach Boardwalk, for instance. You'll find plenty of activities to make your vacation memorable. Or, if you live there, you'll experience beautiful views and beach life every day. Local or tourist, you still need to know. Where do you go for a great place to eat, nightlife, exciting attractions or shopping? The Myrtle Beach Boardwalk is an unbeatable choice. 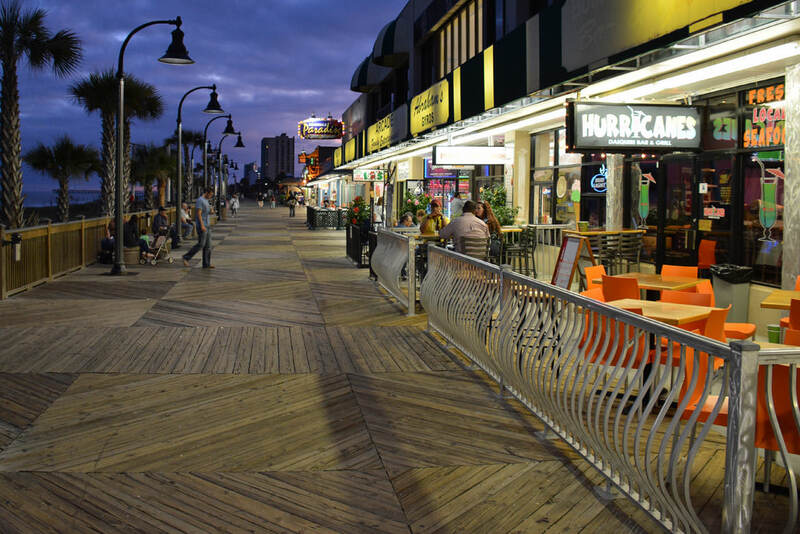 If you're planning a visit to the boardwalk, check out these 10 things you must experience. Myrtle Beach Boardwalk offers over a mile of beach views, attractions, food, and shops. It stretches between the 14th Avenue and 2nd Avenue Piers. It's broken into 3 sections. Scenic views and seating surround the northern section. It includes 14th Pier and Pylar Park. In the midsection, you'll find exciting attractions and businesses. It's much like a carnival from Pylar Park to 8th Avenue. The southern section of the boardwalk is all about the oceanfront parklands. In 2008, the boardwalk started to receive some much-needed renovations. Then in 2010, a revamped Myrtle Beach Boardwalk reopened to the public. With a clever mix of the old and the new, it was an instant hit. These are some of the amazing things the boardwalk now offers to locals and tourists, alike. Check them out and you'll see why this beach boardwalk is one of the most loved in the United States. What is a visit to the beach without a little family fun? That's exactly what The Fun Plaza Arcade is all about. Kids and adults will both enjoy playing games in this open-air arcade. With $5 or $10 in quarters, you can have a grand day of fun. Here are some of the games you can expect to see during a trip to this iconic plaza. Young or old, a trip to The Fun Plaza Arcade will not disappoint! Looking for an unmatched view of the beach? 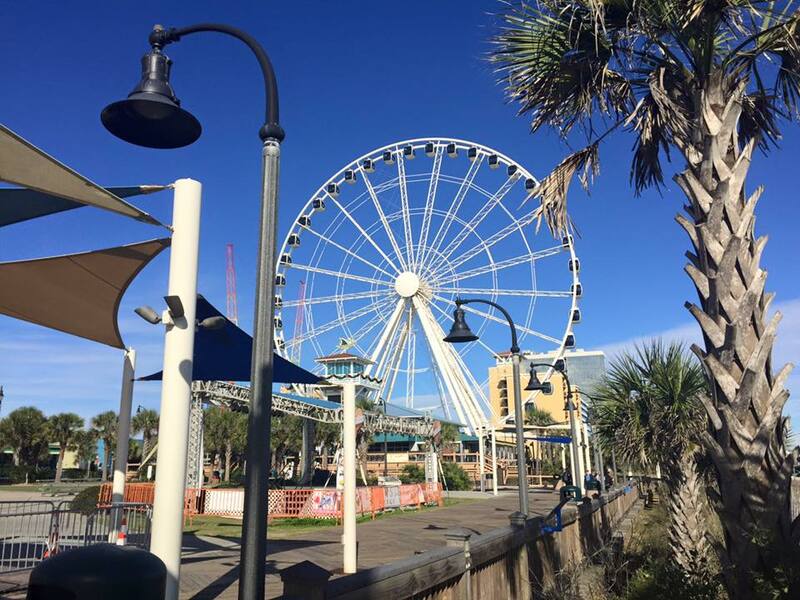 You'll want to take a ride on the Myrtle Beach Skywheel. It's a 200-foot high gondola ride with 42 gondolas that seat 6 people at a time. Each gondola is climate controlled and completely enclosed. Tickets costs around $13 per person. It runs during daylight and nighttime hours. The Skywheel makes a scene when it lights up after dark! Looking for an even better experience? Try the $50 VIP ticket. You'll get to skip the regular line and get a double length ride in a special gondola. It features a glass floor! It doesn't matter which experience you choose. 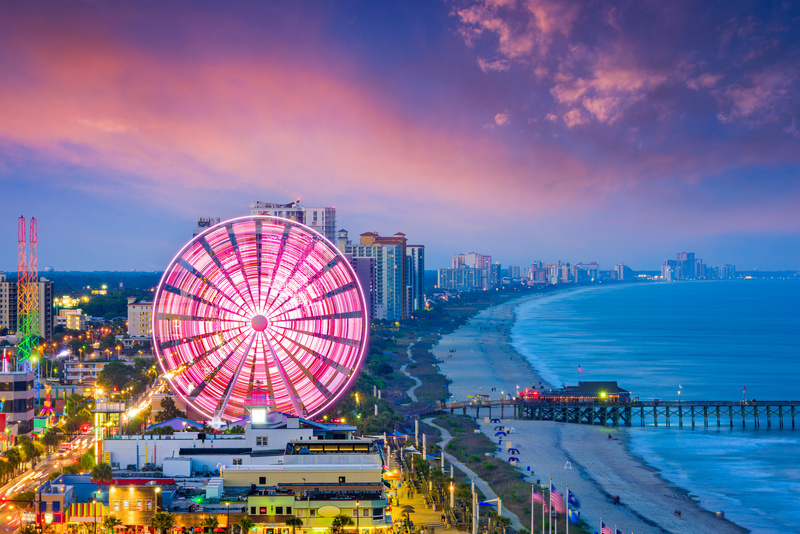 The Myrtle Beach Skywheel provides a panoramic view of the entire Grand Strand area. Be sure to bring your camera for some amazing shots! Part of the allure of a beach vacation is an interesting nightlife. Myrtle Beach Boardwalk is no exception. There are several popular pubs and bars you can try. Here are some you don't want to miss. Duffy's is a relaxed saloon style pub. Come in for drinks, live music and stick around to play some pool. Who doesn't love a Tiki Bar? This one is a hot spot for both locals and tourists. It's a traditional bar with a great beach vibe. A hot, honky-tonk style bar that features live country and rock music. If you like that hole in the wall vibe, you'll want to stop in and check it out. Here's a little tourist bonus. The famous country band Alabama got their start here! You'll find fun memorabilia plastered all over this bar! Open air and ocean breezes abound in this bar and grill. You can get food and drinks, but seafood and beer are their specialties. During summer evenings, this bar offers live music and a great beach bar atmosphere. Find great food and drinks, with a feature on their unique daiquiris. Try them all! You'll find all the traditional flavors and a few new ones, too. There are virgin varieties if you'd like to skip the alcohol. Looking to make yours special? Pick two flavors and make something new with their combo offer. Not into daiquiris? No worries, they've got drinks for you, too. Choose from a selection of beer, wine, and liquor. This one's off the boardwalk, across Ocean Boulevard. But, if you're looking for a heart-racing experience, the SlingShot is for you! Or, you can ride with a friend if you're scared. The Sling Shot has two massive towers with a bungee cord attached. There's a seat for two in the center. When you're released, expect to go as far as 300 feet in the air with speeds up to 100 miles per hour. Then? You'll fall that same distance back toward the ground. The Sling Shot is not for the faint of heart. Thrillseekers won't want to miss it! 5. Ripley's Believe It or Not! Ripley's Believe It or Not! at Myrtle Beach has a lot to offer the curious visitor. And it's all accessible from Myrtle Beach Boardwalk! Check out some of these unique Ripley's attractions. The Odditorium is jam-packed with a strange collection of stuff from around the world. Here you'll see things like shrunken heads and crazy artwork. You can even catch a show! The building is two stories full of strange and exotic experiences. You'll find artifacts and objects from history, too. Enter the Odditorium for around $15 per person. Or, check out some of the combo pricing to see more than one attraction. Got a thing for haunts and scary creatures? There are two Ripley's haunted attractions you must try. Both are on Ocean Boulevard, too. The first adventure takes you on a tour through Grimsby & Streaper Casket Company. It's a massive, multimillion-dollar haunted house filled with live actors and animation. Encounter ghosts and ghouls as you explore the maze and solve a mystery. Or, you can try your hand at the Haunted Adventure Laser Strike attraction. Love a good laser gun battle? Here's your chance to up the ante. Ripley's Haunted Adventure adds in a darkly-themed race for survival. Hold on to your laser rifle and prepare for combat! You'll navigate a massive 10,000 square foot arena. It's filled with terrifying creatures and obstacles. Ripley's Moving Theater is a show with a twist. In a motion simulator, you'll experience 3-D viewing like never before! Feel every turn, bump and drop as the simulator takes you along for the ride. Choose from two 3-D films that include special visual and sound effects. You can ride for about $15 per person. Ok, it's not located right off the boardwalk. But, the aquarium is worth mentioning, since we're talking about Ripley's attractions, anyway. Get an up-close look at sharks, stingrays, jellyfish, and other impressive sea creatures. Ripley's aquarium attraction includes several different exhibit zones for you to enjoy. It's worth the effort of going. Enjoy Ripley's Aquarium before you leave Myrtle Beach! Now, back to the boardwalk! There is quite an array of delicious fair-style snacks and treats on the boardwalk. Looking for sugary treats or greasy, cheesy finger foods? You won't regret this! Boardwalk vendors offer everything from funnel cakes to waffle cones to cheese fries. Speaking of sweets, if you love the sugary stuff you've got to check out I Love Sugar! It's a candy shop featuring anything you could want! You could take a walk down Pier 14. It's a historic pier that's been around since the mid-1920s in one form or another. There's a restaurant, gift shop, and a bait and tackle shop. You can even do a little fishing off the deck if you want. If you plan to eat dinner at the restaurant, larger parties need reservations. It's definitely worth it to take in the gorgeous sunset views! Hungry? Myrtle Beach has some great places to eat. But, you can also walk down the boardwalk to find a good meal. You can stop in at some of the pubs we talked about. Bowery's, Duffy's and Hurricane's Bar and Grill are great options for a quick bite to eat. Or, you can check out one these local eateries for a nice change of pace. Oysters, shellfish, steaks, hot wings, sandwiches, and burgers are among the menu choices. Not to mention sides and a drinks menu, too. You've got plenty of options at Dirty Don's Oyster Bar. A local spot, Peaches Corner offers burgers, hot dogs, and grilled sandwiches. It's convenient and reportedly the best burger around! Don't forget to try the fried pickles and cheese fries! Right around the corner from Peaches, you'll find Mammy's Kitchen. Boasting the Best Breakfast in Myrtle Beach, Mammy's Kitchen is a must visit eatery. It's a local spot that's been around since the 1950s. Mammy's Kitchen is full of tradition and history. Every vacation includes a shopping trip. How else are you going to find souvenirs and gifts for people back home? 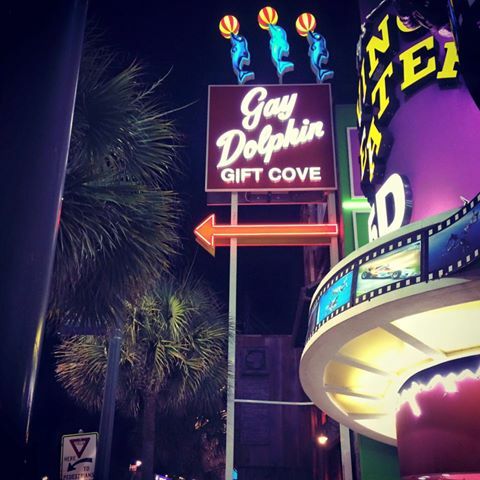 You'll find no better place than Gay Dolphin Gift Cove. Think of it as a department store for souvenirs. It offers 26,000 square feet of Myrtle Beach themed items. You'll find shot glasses, sharks teeth, tee-shirts, sea shells, coffee mugs and more. After you're finished shopping, take a look at the observation deck! You'll love the views from up top! What's great at the Myrtle Beach Boardwalk? Well, the boardwalk, of course! We can't forget to slow down and take in the beautiful ocean views a stroll on the boardwalk offers. In the summer months, you can find concerts and events on the boardwalk. Popular seasonal events make the boardwalk a place to hang out at any time of year! All along the northern area, you'll find built-in benches. There are scenic overlooks and plenty of places to stop and rest. You can people watch or look out over the beach. There's over a mile of protected views! 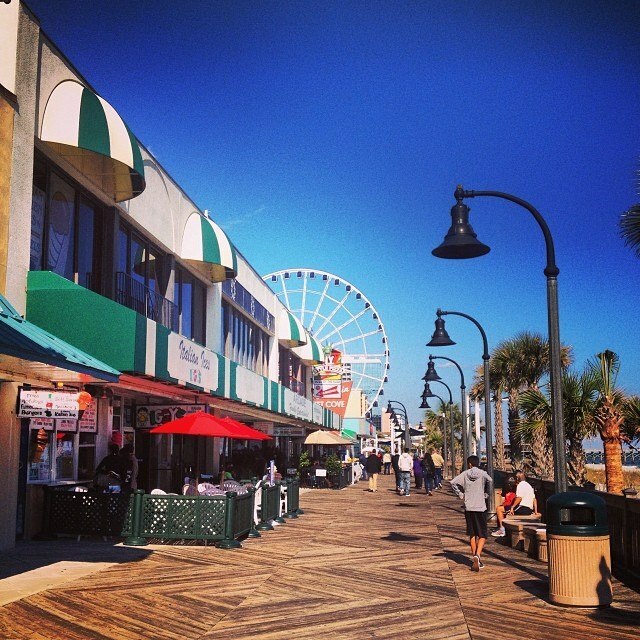 Whether you're a local or a tourist, you must check out Myrtle Beach Boardwalk. It's got everything. Breathtaking ocean views, great attractions, and plenty of places to eat. There's something for everyone! Looking to move to the Myrtle Beach area? Send us a message! 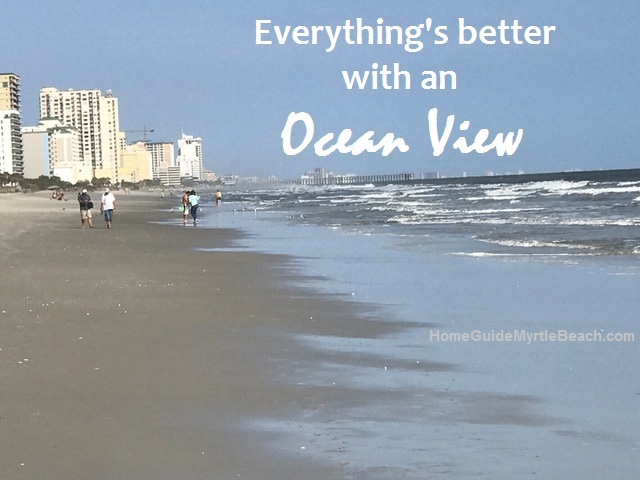 We'd love to help you find your Myrtle Beach home.